In this post, from IDW Publishing: Wraith: Welcome to Christmasland #2 and from Image Comics: The Walking Dead #118. AKA it’s the bestest and bloodiest week of comics ever. Even if there’s only two of them. In the continuing prequel to Joe Hill’s NOS4A2, we are introduced to Denis Sykes, the King Geek of the Daniels and Howard Circus who took his love for biting the heads off chickens and turned it into a life of crime and robbery. While still biting off the heads of house pets. Hey, you gotta keep your signature. Now he’s on his way to prison in a Department of Corrections vehicle with some fellow damaged criminals and even more damaged correctional officers. Be warned, this is the most horrifyingly bloody issue yet (I know it’s only one of two, but still), complete with sassy, older female you’d like to hug and all the raw dialogue you would want from a prison movie. Minus jokes about bunnies and boxes. 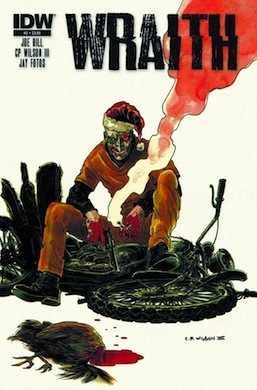 Whereas the first issue of Wraith was completely dedicated to the horrifying and feel-inducing back story of the charismatic villain Charlie Manx, Wraith #2 follows a decidedly different course and for a few pages there I wasn’t even sure if I was reading the right comic or not. Where’s the Christmas? Where’s the Wraith? Don’t worry though, if you’re confused, you’ll eventually get to that fabulous ending and it will all start to make sense. And then you will immediately want to read issue number three. It’s going to be a long month isn’t it? SLIGHT SPOILERS IN TERMS OF PLOT IF YOU DID NOT READ THE LAST TWO ISSUES OF THIS ARC (SPECIFICALLY #116 and #117)! As far as stories in the “All Out War” arc, this was one of the tamer ones. 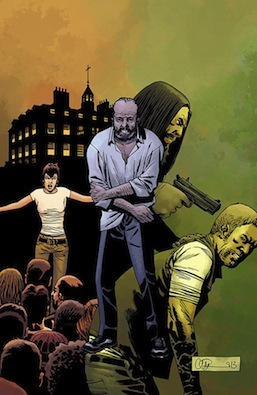 Issue number four of twelve is split between the Hilltop where Maggie is showing everyone that she’s the boss and the Alexandria Safe-Zone, where Carl has fully blossomed into an awkward teenager (seriously weird) and Ezekiel tells Michonne about his part in the most recent war. While a lot of ground is covered, not much advancement to the story is made in terms of plot. We don’t know how Rick is doing, and we certainly don’t know what has become of Negan’s captive Holly. Still, you might feel things. Over at the Hilltop, Maggie utters perhaps the most ridiculous line in the entire series: “I believe in Rick Grimes” as if he’s running for political office instead of trying to take down nefarious villains, all while proving to be a leader on her own. A pretty good transition from the girl Robert Kirkman left behind in issue #100. Just please don’t yell that anymore. Meanwhile, Ezekiel tells his own tragic tale of the people who died fighting for him. If you don’t remember, Ezekiel is the badass with the pet tiger. (Note to self: get a pet tiger before the zombie apocalypse to kill all my zombies for me.) Just be warned, you might need your hankies out for this one.